We have different varieties of bulgur in our country. Basic bulgur is made by boiling the wheat first and then drying it. Next, is the peeling of the skin and finally milling it into different sizes: fine, medium, and coarse. 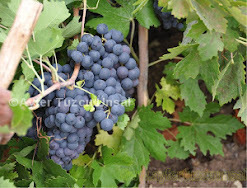 In Erzincan, however, it is only used in its coarse form. Firik is another type of bulgur. Here, the wheat is smoked before it gets ripe. Then the skin of the wheat is discarded in the last stage by being passed through a sieve. This particular bulgur is widely used in the Middle East and North African countries. There is yet another variety of bulgur widely used in Gaziantep which is called ‘chee bulgur’, in other words, raw bulgur, and is prepared by first skipping the boiling stage. Here, the skin is peeled first and then milled into a fine size. The fine size is called ‘sefer kitel’ which I call raw bulgur and is used in ‘eechly kufte’ in eastern and southeastern Anatolia. In Malatya, they make ‘sarma’ with cherry leaves and bean leaves. The starch in ‘sefer kitel’ helps to hold the filling inside the leaves. ‘Siyez”(emmer)’ and ‘kavlica’ are also well-known bulgur varieties. These types are grown locally and have not been modified. They may go back as far as the Hittites. Anatolia is rich with all varieties of bulgur dishes, one very different from the other. Malatya is famous for its different types of’ 'eechly kufte’. For example, in the filling for 'eechly kufte’, roasted and mashed poppy seeds are used. Have you ever heard of this type of 'eechly kufte’? When people of Gaziantep talk about ‘tarhana’ (soup made with dried curds of flour) what they really mean is a dessert made of grape juice and raw bulgur. Bulgur can also be used as a fermenting agent. The people of Adana and Hatay ferment it with turnips to prepare ‘chalgam’ (a fermented) drink. Those who know how to make ‘boza’ (fermented millet) use bulgur as a yeast. Couscous is made by coating flour around fine bulgur grains. Couscous is mostly made in the Marmara, Thrace, and Aegean regions. In certain regions, ‘tarhana’ is made with bulgur instead of flour. 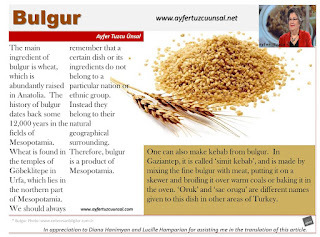 Another type of bulgur is made in the Dardanelles. Boiling the wheat with milk instead of water makes ‘goce’. A type of ‘manti’ is made with goce. In eastern Anatolia, most recipes with bulgur are made with animal fat, but you can also substitute olive oil for the animal fat. For example, one can also make ‘dolma’ and ‘sarma’ with lean meat and olive oil, which gives it a delicious taste. The locals in Anatolia have found numerous ways of saving money. After they grind the bulgur and lentil in the mill, the make use of the remaining flour by making bread. The flour must be used immediately. There are many varieties of this type of flour.“Firin’ is the name of the food made with bulgur flour that is mixed with meat. One can also make kebab from bulgur. In Gaziantep, it is called ‘simit kebab’, and is made by mixing the fine bulgur with meat, putting it on a skewer and broiling it over warm coals or baking it in the oven. ‘Oruk’ and ‘sac orugu’ are different names given to this dish in other areas of Turkey. Bulgur has also been used as as exchange commodity. Performers in theaters were given bags of bulgur as wages and fees. During religious holidays, well-to-do families would give bulgur to the poor. Prior to the printing of wedding invitations, well-known women in the community would go from door to door and do the invitation orally. It was customary to treat these women with a bag of bulgur. They used to say, “Make a rice pilaf and put is aside, but make a bulgur pilaf and eat it right away” meaning that rice will taste better when it rests, whereas you can eat bulgur right away. Damietta is famous port in the Suez Canal. Many years ago, Egypt used to export rice in wicker bags to Anatolia. A Turkish merchant was going to Damietta to purchase rice, but was robbed of his gold by pirates in the Mediterranean Sea. In his profession as a trader, he lost what he already possessed. In other words, you if are not careful, you can lose your assets. In appreciation to Diana Hanimyan and Lucille Hamparian for assisting me in the translation of this article.